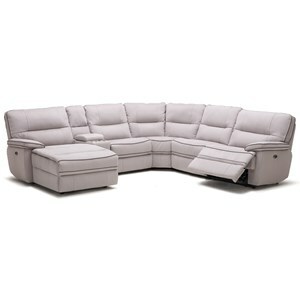 Turn any room into an awesome entertainment space with this multi-recliner sectional. 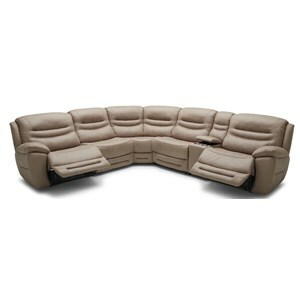 This sectional configuration offers four seats, three of which recline, so your family doesn't have to fight over who gets the best seat in the house. Plus the sofa is fully-equipped for movie night snacks or munchies for the big game with two built-in cupholders and a console with hidden storage. Make the most of your entertainment space by upgrading to power recline and adding two USB charging ports to either end. 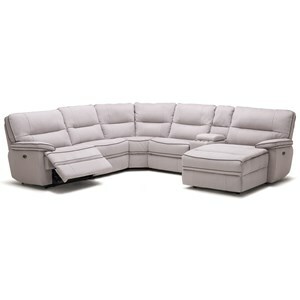 The KM012 Six Piece Power Reclining Sectional Sofa with Cupholder Storage Console and USB Ports by Kuka Home at Beck's Furniture in the Sacramento, Rancho Cordova, Roseville, California area. Product availability may vary. Contact us for the most current availability on this product. 132112681 Power Armless Recliner 1 30" 37" 41"
132112682 Armless Chair 1 30" 37" 41"
130112681 LAF Power Recliner 1 39" 37" 41"
134112680 Wedge 1 46" 0" 41"
KM012-STA Storage Console 1 13" 37" 41"
131112681 RAF Power Recliner 1 39" 37" 41"